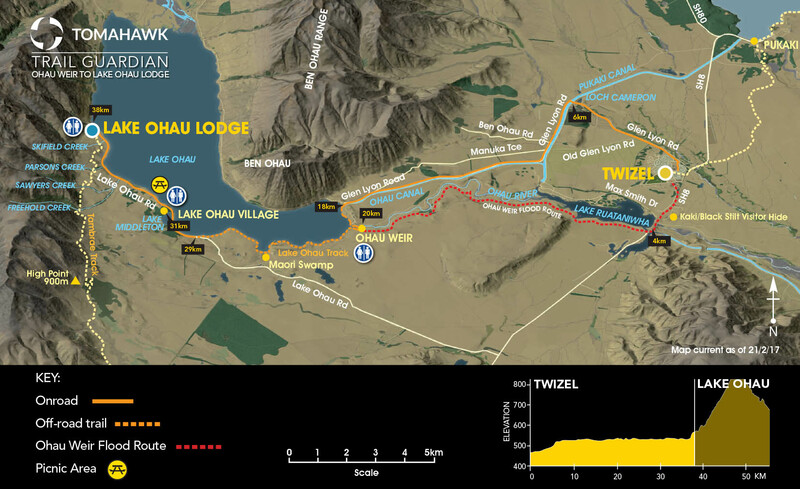 Alps 2 Ocean Trail Information - Check out the best trail in NZ! The Alps 2 Ocean Cycle Trail is truly one of New Zealand’s great rides! For over 300 km and dropping in altitude 780m, visitors can experience some of the most beautiful scenery New Zealand has to offer. Suitable for those with a reasonable level of fitness and skill level, the trail is easy to moderate and offers a pleasing mix of on and off-road trails which link the Southern Alps to the mighty Pacific Ocean. The following information describes the sections of the Alps 2 Ocean trail itself, our tours have slight variances in your planned daily travel destinations but for information on our 8 day tour package we offer head over to the Alps 2 Ocean itinerary page! 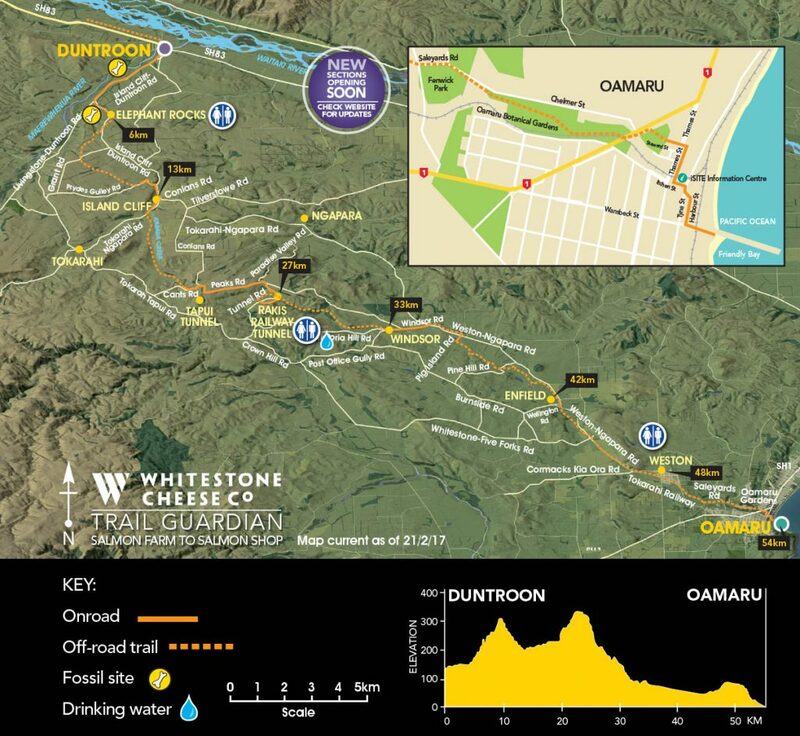 The Alps 2 Ocean Cycle Trail starts at the White Horse Hill Campground, which is 2km north of Mt Cook Village. From here, a 7.2km off-road trail takes you to Mount Cook Airport [8km], where riders will need to make a short helicopter flight across the Tasman River to Tasman Point. Travelling in a helicopter across a glacially-fed braided river with New Zealand’s highest mountain in view is a must do. The helicopter can carry up to 6 passengers at a time (depending on weight limits). The trail continues along a quiet country road that follows the eastern shore of Lake Pukaki, passing the Tekapo B power station [18km]. Riders will enjoy outstanding vistas across Lake Pukaki towards the Southern Alps. A wide range of native plants grow along the lake edge including kowhai and flax, as well as exotic species such as larch and pines. 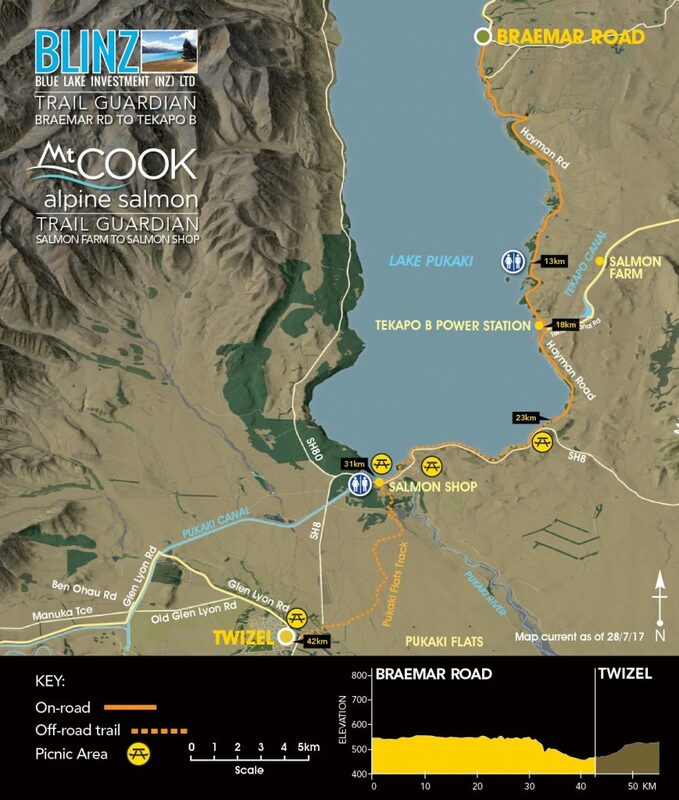 The off-road trail starts at the bottom of Hayman Road [23km] and follows the Lake Pukaki shoreline. With Aoraki/ Mt Cook as a backdrop, the trail passes over the Pukaki dam, taking you to the car park at Lake Pukaki Visitor Centre [31km]. You then cross the highway and follow the trail across Pukaki Flats – an expansive area of dry grasslands that are characteristic of the Mackenzie landscape. This takes you to the town of Twizel. Take care crossing the State Highway. From Twizel, you follow Mackenzie Drive, then Nuns Veil Road which takes you to Glen Lyon Road. Follow this until it crosses the canal bridge just past Loch Cameron [6km]. After crossing the bridge, stay on the two lane northern side of the canal road until reaching the edge of Lake Ohau [18km]. 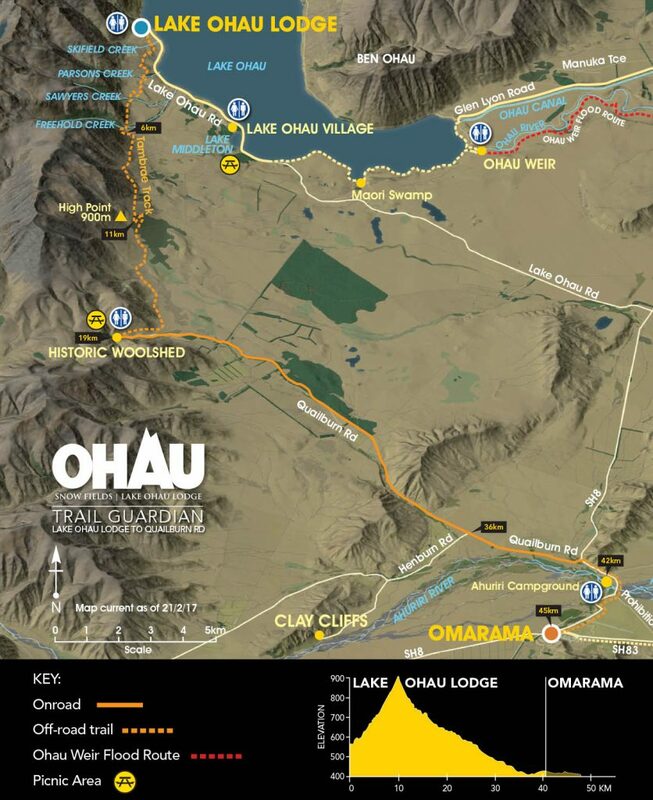 From there an off-road trail descends down to the lake foreshore, taking you to the Ohau Weir [20km]. After the weir the trail skirts around the lake foreshore where it eventually meets up with the sealed Lake Ohau Road [29km]. Follow the road for the final 10km to Lake Ohau Lodge (you go past Lake Ohau Village). Leaving Omarama you ride east down the Waitaki Valley, following the off-road trail to the top of the Chain Hills [5km]. From here you descend beside State Highway 83, then follow the edge of Lake Benmore to Pumpkin Point [10km]. Continue beside the lake to Sailors Cutting – a popular boating, fishing and camping destination [13km]. 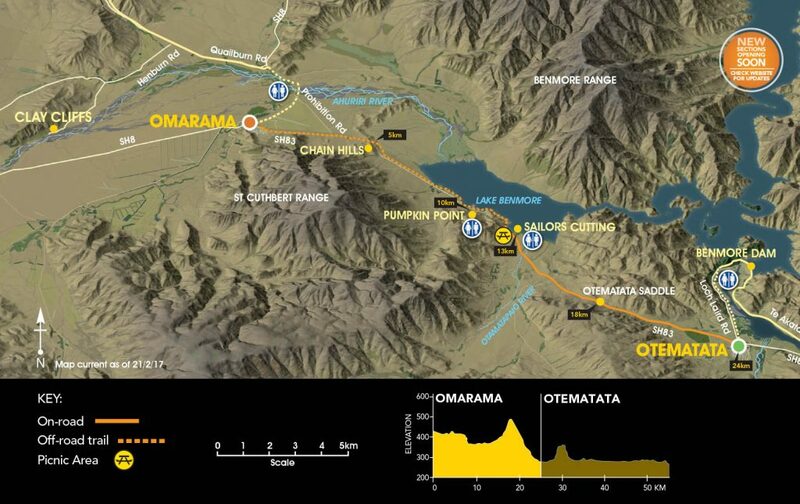 Then it’s a short on-road climb up to Otematata saddle with views of Lake Aviemore and the valley beyond, then downhill all the way to Otematata. From Otematata, take the sealed payhway beside Loch Laird Road, then follow the gravel track beside the lake. This takes you through several camping areas. You then ride up Loch Laird Road onto the massive Benmore Hydro Dam [6km]. It’s a steep road up to the dam, so you may need to walk the last 800 metres. Follow the Te Akatarawa Road along the margins of Lake Aviemore to the Aviemore Dam [28km]. 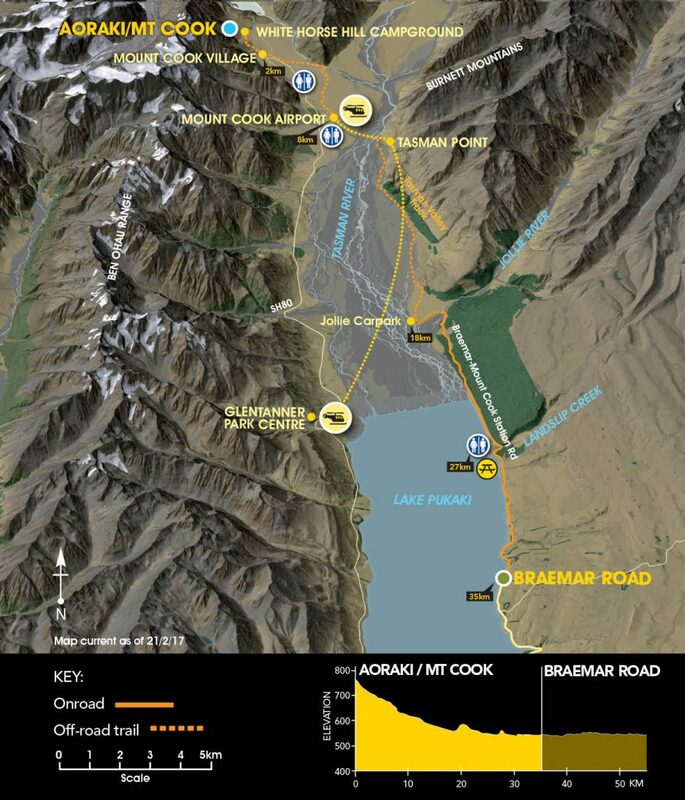 After crossing the dam the trail follows State Highway 83 to Lake Waitaki and the Waitaki Dam [36km], then to Kurow. This section of trail has an interesting hydro history with dams and project towns. The off-road trail starts at the eastern end of Kurow between the museum sheds. A gravel track takes you across to the Waitaki River which you follow down the valley. You cross Kurow Creek [3km] then ride up and alongside the highway. 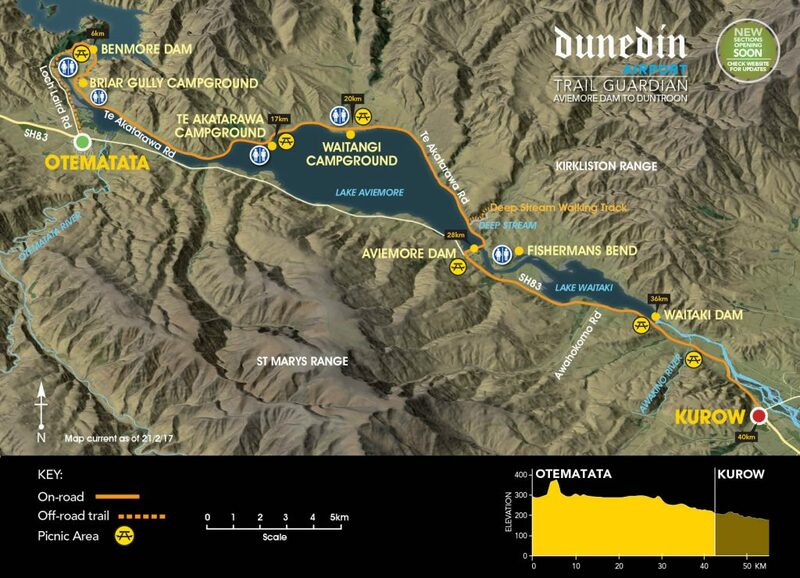 You ride through the winery [5km], then ride back towards the Waitaki River and follow the Waitaki Haul Road, crossing the Otiake River [11km] and the Otekaieke River [15km]. This section of the old Haul Road is shared with recreational vehicles. The trail then follows the highway to the Takiroa Maori rock art site [23km] which is across the road from the trail. 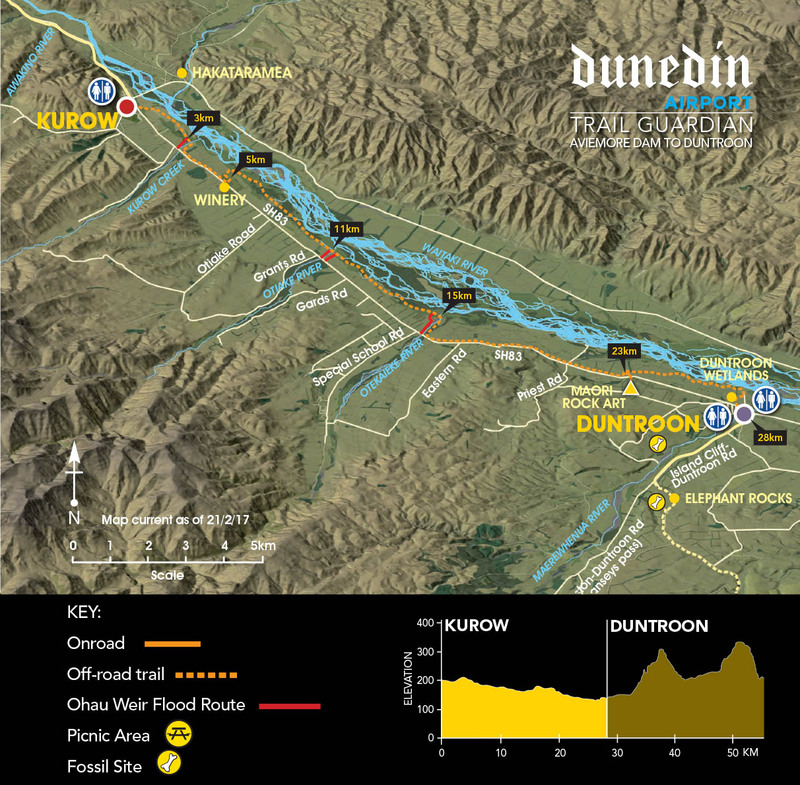 After visiting the rock art site, retrace your steps and continue on the trail that heads back down to the Waitaki River and through to Harris St. Halfway up Harris St you turn right and ride through the Duntroon Wetlands before emerging in the centre of Duntroon. From Duntroon you head south-west to the unique rock formations known as Elephant Rocks [6km]. An off-road trail then takes you through several farms. You rejoin the road at Prydes Gulley which takes you to Island Cliff [13km] which is surrounded by limestone escarpments. Keep veering right on the road until you get to Karara Creek where you go off-road again. A series of gravel roads (Cants, Peaks then Tunnel Rd) take you to the Rakis Railway Tunnel [27km] where there is a toilet, picnic spot and drinking water. Next stop is Windsor [33km], then an off-road section of trail takes you through farmland to Enfield [42km] and onto Weston [48km] where you rejoin the old railway line for a flat run to Saleyards Rd. Follow the sealed cycleway downhill to the Oamaru Gardens. Bike through the gardens, across SH1, then through the park to the main street (Thames Street). Turn right into the far lane and ride south past the i-SITE, turning left on Itchen St, right onto Tyne, then left onto Harbour St. Go through the Victorian Historic Precinct to the Oamaru Harbour where the trail ends at Friendly Bay and the Pacific Ocean! 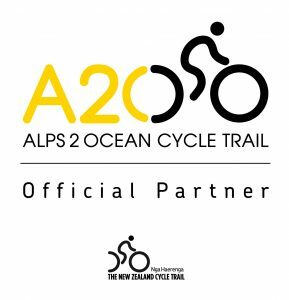 We are an Alps 2 Ocean Official Partner!